Based on the fact that Christmas cards were not offered for sale in the United States until 1875 or that White House Christmas cards were not officially sent out until the Eisenhower administration almost 80 years later, it is highly unlikely that James Monroe, the fifth President of the United States, even thought of practicing what we now do almost subconsciously – sending Christmas cards to friends and loved ones during the holiday season. Monroe, a Virginian who is considered the last of the United States’ Founding Fathers, was, however, one of the participants in what may be the most famous Christmas in our nation’s history. It was on Christmas in 1776 that Monroe, a lieutenant in the Continental Army during the Revolutionary War, was wounded in the shoulder serving with General George Washington in the surprise attack against the Hessians at the Battle of Trenton in New Jersey. 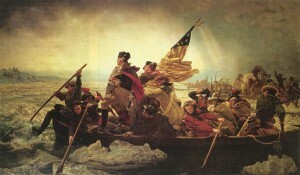 In fact, in the famous 1851 painting by German-American artist Emanuel Leutze, it is the young James Monroe who is shown holding the flag as Washington leads his men into battle as their boat crosses the Delaware River from Pennsylvania into New Jersey. Had the exchanging of Christmas cards been a custom back in Colonial times, certainly none would have been exchanged between the pro-British Hessians and the revolution-minded colonists! James Monroe’s endeavors during the early history of our country compare favorably with other Founding Fathers like John Adams, Thomas Jefferson, and Benjamin Franklin. His intellect, courage, and common sense helped propel the new nation onto the world’s stage. Before he became president in 1817, Monroe served in the Continental Congress, as a Virginia Senator, as a minister to France under President Washington, as the Governor of Virginia, as a minister to Great Britain under President Jefferson, as the Secretary of War, and as Secretary of State. Monroe was born on April 28, 1758 in Westmoreland County, Virginia. Following the end of his military career and working as a lawyer in the mid-1780s, he met and married 17-year-old Elizabeth Kortright, a member of a prominent New York City family. His interest in politics and his ascension into public service eventually gave him the opportunity under President Jefferson in 1803 to be one of the negotiators in the acquisition of the Louisiana Purchase, which nearly doubled the size of the United States. A decade or so later, in August of 1814, while serving as Secretary of State under James Madison, Monroe exhibited the same bravery shown on that long-ago Christmas Eve in 1776 by leading a scouting party to verify an impending attack from British troops stationed near Washington, D.C. during the War of 1812. This gave President Madison ample time to evacuate the government, and for Monroe to personally save two precious documents – the Declaration of Independence and the U.S. Constitution – before they could be destroyed by the invading British soldiers. In Emanuel Leutze's famous painting, "Washington Crossing the Delaware," James Monroe is featured holding the American flag in General Washington's boat on that famous Christmas Day in 1776. By November of that year, Secretary Monroe had situated five American peace commissioners in Ghent, Belgium, who were responsible for negotiating a treaty with British and Irish leaders to end the war. With the countries agreeing to revert back to the way things were prior to the outbreak of war, the Treaty of Ghent was signed on Christmas Eve. A letter to the future President Monroe from one of the commissioners, Albert Gallatin, was undoubtedly a most welcome “Christmas card.” It stated that the treaty of peace had been signed the day before. With President Madison’s two terms over in 1816, Monroe ran as his successor, earning an easy victory. A strong, non-partisan leader, Monroe’s first term was known as “The Era of Good Feelings” since Americans were relieved that the War of 1812 was finally over. Despite an economic depression, dubbed the Panic of 1819, Monroe’s popularity remained high. His major accomplishment as president was the issuance of the Monroe Doctrine; delivered to Congress a few weeks before Christmas of 1823, Monroe warned European powers to give no thought to expanding into the Western Hemisphere and stated the United States’ intention to remain a neutral power regarding European conflicts. Any interference by a foreign power would be regarded as an unfriendly act against the U.S., a policy which became the standard for the remaining part of the 19th Century. James and Elizabeth Monroe and their two daughters, Eliza and Maria, were modest people who enjoyed their privacy. Occasionally, Eliza took on the duties as the official White House hostess when the First Lady was ailing. In 1820, history was made when Maria married her second cousin; it was the first wedding ever performed in the White House. Christmas of 1824 was the last one the Monroe family spent in the White House. Since there is very little known about Monroe’s religious beliefs, it is unknown how the family may have celebrated the Christmas holiday. In modern times, at the James Monroe Museum in Fredericksburg, Virginia, not only is there an annual exhibition showcasing what the Monroe home would have looked like at Christmastime, but other festivities include fireworks, a display of Christmas dishes such as candied fruits and plum pudding, and decorations which include mistletoe, ivy, and holly. After the end of his presidency, Monroe and Elizabeth resided in Oak Hill, Virginia until her death in 1830. Then the former president moved to New York City to live with his daughter, Maria, and her husband. 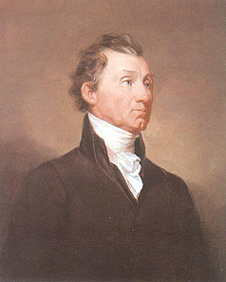 James Monroe died from tuberculosis and heart failure one year later on the 4th of July – the third president of the first five in our country’s history to pass away on the date of the birth of our nation. Originally buried in New York, Monroe’s body was re-interred in 1858 to the Hollywood Cemetery in Richmond, Virginia, where he lays near our 10th president, John Tyler. I guess it was socially accepted back then to marry your second cousin! This is some interesting information.. I just learned something new.